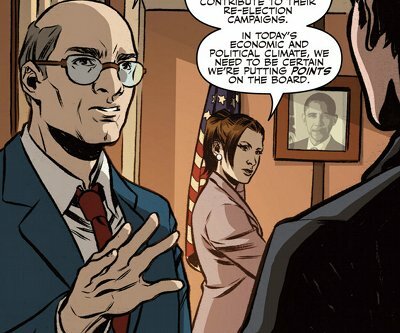 After the five-issue mythology “Believers” arc, Season 10 moves into stand-alone territory with the two-issue “Hosts“, in which we get the first glimpse at how Season 10 will deal with “Monster of the Month” stories, and we get to see Mulder & Scully from a different artist. This is the first issue where Chris Carter does not get a story credit: this is a solo Harris project! The new FBI: How nostalgic can you get? Season 10 has, since its beginning, played a lot on the retro nostalgia factor in order to draw its readership — which surely consists of people who are fans of the X-Files or at least were somewhat casual viewers of the show either when it aired or later. The 1990s look of Mulder & Scully, the covers that are even more 1990s than the story itself (FBI suits vs civilian clothes inside the issues), the return of old (and deceased) characters, the promise to do sequels of old episodes, the decision to put them back at the FBI as field agents compared to their situation in I Want To Believe… Writer Joe Harris might say in interviews that he wants to mix new modern threats with retro elements, but a lot of what we see in Season 10 focuses on the “good old days” feeling instead of boldly breaking new storytelling ground. This is quite strong in this issue. 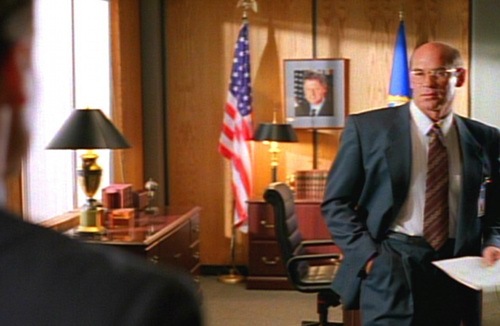 We get to see Skinner’s office, still the same with its table, horizontal blinds and photos hanging (only now it’s Obama, not Clinton; photos above & bloew from 2X02: The Host). Is Arlene Pileggi still his assistant? 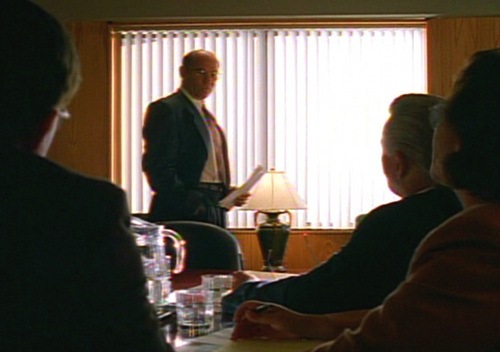 We meet the person to whom Mulder & Scully will be reporting to now that Skinner is higher up in the FBI hierarchy: Assistant Director Anna Morales. Young (“youngest member of the Bureau to rise to this position“), beautiful (Scully immediately teases at Mulder’s wandering gaze), Hispanic (a rarity in the world of XF, and something XF couldn’t miss in the 21st century! ), disillusioned with politics and lobbying (very post-2008! ), she considers the X-Files as a pile of accumulated cases that might become an easy way to increase her score of solved cases — essentially a careerist-driven means for ascending within the FBI. This rationalization of why the FBI is even remotely interested in the X-Files works, somewhat, although as we well know we won’t have Mulder & Scully magically solving everything. Plus she’s a woman in a position conservatively attributed to men, which apart from Scully we saw in the show only too rarely. 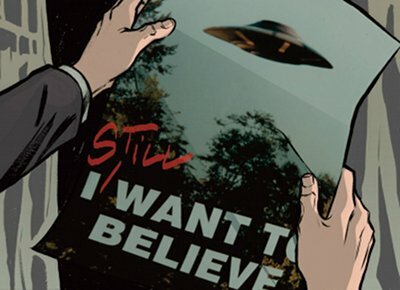 AD Morales says “Potential X-Files have piled up over the last few years. I’m particularly interested in old cases that haven’t been closed.” This is the rationalization for us to see several issues of Season 10 that will be sequels of classic XF episodes. I hope XF won’t turn into “Cold Case“, but the mix between mytharc, sequels and new “monsters of the month” makes sense. The new/old case: Invasion of the Fluke People! 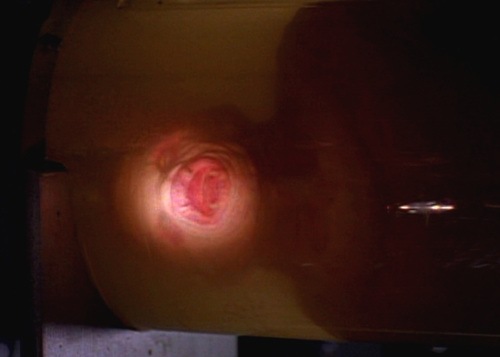 Scully autopsies the lower half of the original Flukeman from 1994 — which testifies for two things: it’s odd that no such thing was done back then, given the extremely valuable evidence they had in hand, and that Quantico’s fridges work well. Once out from the fridge, the fluke cells reactivate and very, very quickly regenerate into a full body — cut short by a shower of hydrochloric acid. This scene has a big shock factor, though it is quite extreme in the way the whole thing is shown compared to a more low-key approach based on suggestion in the TV episodes. Mulder investigates in Martha’s Vineyard and peeks at passing by bikini-wearing beachgoers — given how old Mulder now is (around 52), this doesn’t have the same connotations as if he were doing it 20 years ago, maybe it’s a wink to “Californication“? 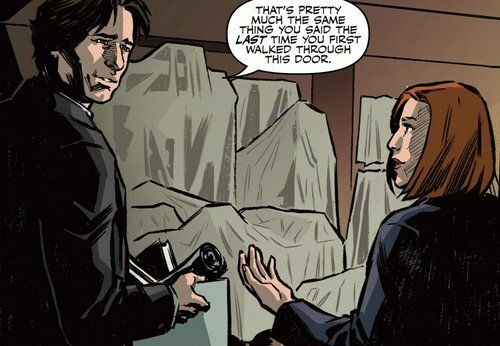 Mulder very directly speaks about creatures and parasites, and gives around warnings: the story takes as a fact upfront that this is about the same Flukeman they had encountered before, although that’s more of a result of the constrained length of the comics issue than a conclusion of any investigation. This is some worrisome news on whether X-Files stories can be given a proper treatment in cases that extend to two or even one issues! The local Sheriff, Michael Simmons, plays down the importance of the recent disappearances; he also mentions as having Ukrainian origins, and has a photo of him in navy uniform with another man. 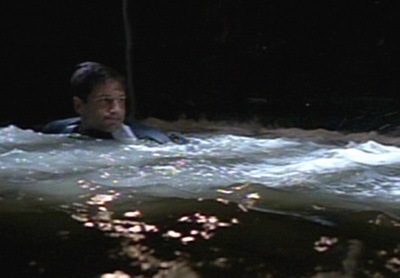 In the storm overflow drains, Mulder finds the disappeared victims purposefully bound there, and is confronted with several Flukies, who had used these bound victims as hosts. We can expect the second half of the story, in the next issue, to be as such: The original Flukie was a Ukrainian sailor who suffered genetic mutations following the Chernobyl accident of 1986 (Chernobyl is in Ukraine, not Russia). His brother followed him to the USA, changed his name, and became a Sheriff in order to protect him, and he is the one providing him with hosts. 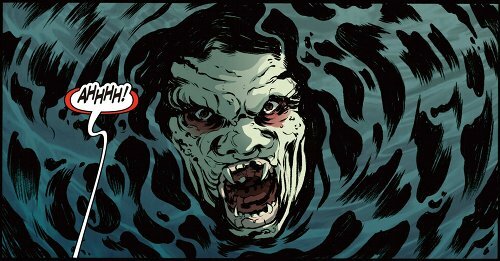 Instead of Michael Walsh’s minimal and strong pencils artwork, for these issues we get the art of Elena Casagrande, credited “with and Silvia Califano” (“pencil partner” according to Casagrande) — it’s unclear how the two divided tasks, I suspect Casagrande did pencils and Califano added certain computer-generated art like textures of water, lights, trees, microscope views, all of which are different from the actual coloring (done by Arianna Florean). This is a complete change of style: the page structure is more “modern”, panels overlap, elements spill over outside panels, faces and silhouettes are much more comics-like (or Young Adult cartoon-like), black instead of white borders, the inclusion of much more advanced texturing, lighting and coloring effects (obviously computer-enhanced), all give a definitive modern, “21st century” feel. The faces have less of a likeness to the actors compared to Walsh’s, which is not necessarily off-putting, but they do look much, much younger than the actors in the present — which adds to the sensation that Season 10 is trying very hard to push us back in 1994! There are certain things here I like better (mainly textures), but I had grown attached to Walsh’s gritty and “classic cinema” style. Future issues seem to be going back and forth between Michael Walsh and other artists, which might mean that IDW is either trying to have Season 10 be a series of “guest artists” with Walsh doing the mythology issues, or that it is still undecided on who should be the lead consistent artist for Season 10. I find the first option very creative and interesting. With a release for some reason delayed late in the month of November, the second half of “Hosts” is coming out barely two weeks later! In just under a week, issue #7 is released along with the first collected volume for Season 10. Given how these things multiply, I can hardly imagine how some Flukie wouldn’t survive for a potential sequel of a sequel in 2033. To paraphrase “Jurassic Park“, life and pop culture franchises always find a way! This entry was posted on Saturday, December 7th, 2013 at 12:48 pm	and is filed under Comics. You can follow any responses to this entry through the RSS 2.0 feed. You can leave a response, or trackback from your own site. Hum the poster was taken by Doggett at the end of the tv show ! Yes, but it somehow found its way to Mulder’s lair in “I Want To Believe”! Great catch, that’s most certainly right! Way to go Harris!